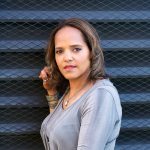 Terri Lyne Carrington is a Grammy-award-winning drummer, composer, and bandleader. She has performed and recorded alongside Herbie Hancock, Wayne Shorter, Al Jarreau, Stan Getz, David Sanborn, Carlos Santana, John Scofield, Joni Mitchell, Joe Sample, Cassandra Wilson, Clark Terry, Dianne Reeves, and many others. She currently serves on the faculty of her alma mater, Berklee College of Music, from which she also received an honorary doctorate in 2003.